Sorry this has been delayed, it’s been a hectic few weeks doing lots! 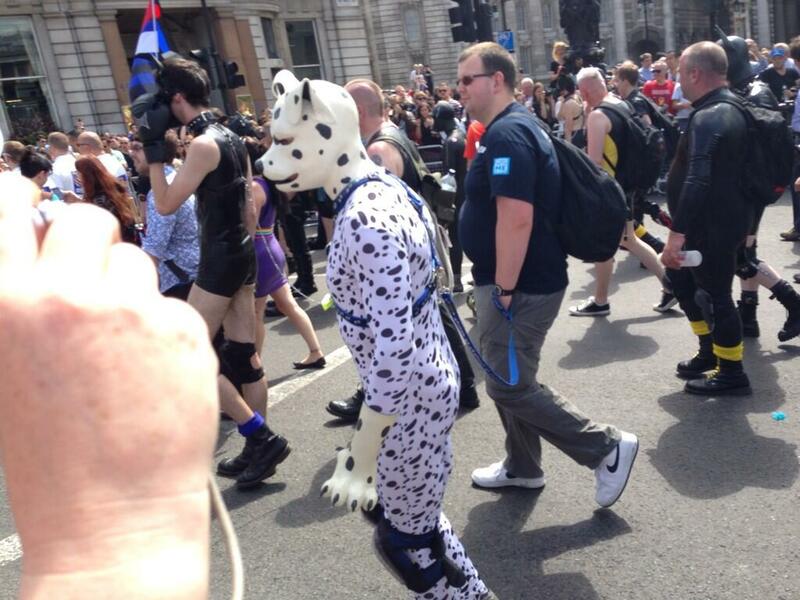 Saturday 27th June saw the London Pride parade taking place, and this puppy was out walking. Unlike last year, the weather was a little nicer – with glorious sunshine and warm temperatures compared to the rain of last year. We set off from home, with the intention of getting the train and that I’d travel in as a pup… which meant I had to change in the station car park and then board the train *wags*. 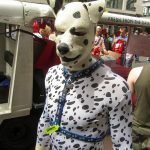 I’d decided that, as much as I wanted to do full hood and paws, this was probably not a sensible idea due to the heat. 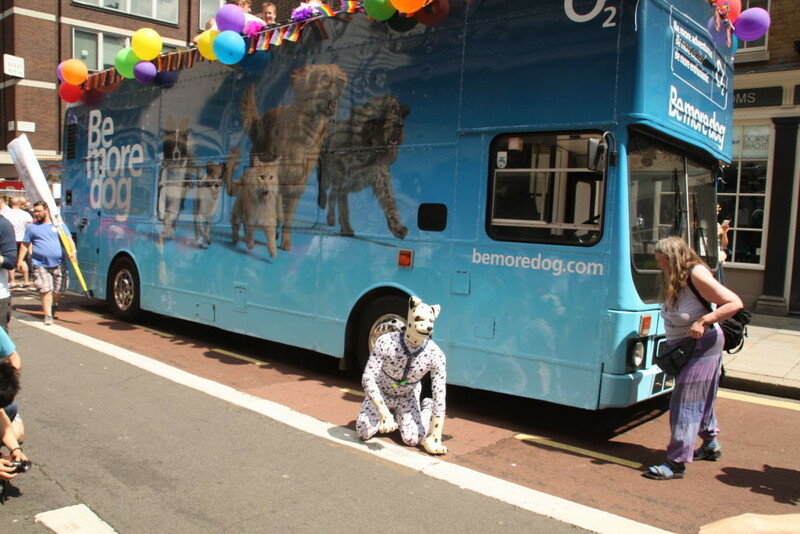 The puppy assembly point was near the o2 “Be More Dog” bus which meant the opportunity for a photo was just too tempting. 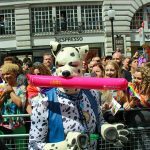 After the picture wast taken and before the walk, I went off to find a tree – 25 minutes later standing in a queue, I hadn’t had the chance to use one so I had to come back to assemble for the parade, and get fully kitted up. Then we waited… and waited… and waited. 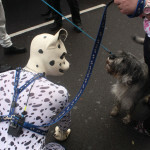 We then turned on to Oxford Street and everything started moving that little bit quicker, and again, I was alternating from 4 to 2 legs – barking all the way. 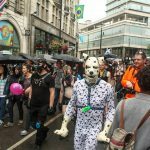 Somewhere down Oxford Street, we gained a blow up football which a few of the pups started playing with at various slow points during the route – for some reason, it seemed to keep re-appearing with us even if we ended up throwing it in to the crowd! *wags*. I also found a cardboard tube, which I was using as a big stick, chewing my way through it … but after a while, I gave it to another pup, who put it down 🙁 … A different blow up beachball got thrown at me, which I went to pick up with my mouth, as all good pups should do, but it went flat … *puppy eyes* it wasn’t me … … honest! After the parade, we did a few photos then went to join the rest of the pups in a nearby park for a quick lunch. 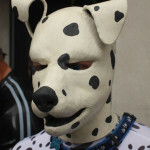 After a quick bite to eat, I got re-pupped up to head for Nandos with my hood and paws, when a small ball arrived at my front paws. 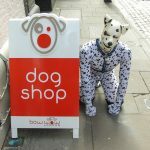 It came from a small child who was shouting happily ‘dog’ at their mum. i bopped the ball bck, whereupon it got thrown back to me with a happy ‘dog’ from the child. A photo with mum and the tot followed, before heading off for Nandos. Both Marbles and I rode the tube as pups, sitting in front of the door much to the amusement of other passengers. Yet again, another fantastic day out – and with more pups than previous years as well. 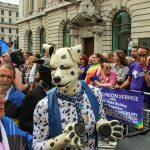 Today saw the Annual London Pride Parade and this pup was part of it, courtesy of Puppy Pride organising the walking group. So this morning, I sorted out the outfit, and as an added twist I included my E-Stim Systems Remote Box. There was a reason for the Remote Box though … Caz from E-Stim Systems was going to be my handler for the day so that my owner could take pictures. Due to a slight delay at home, we got off a bit later than planned, but still with enough time to get there before the Parade started. En-Route, we met with Caz and Wayne and carried onto Baker Street. … A quick loo stop and snack and then down to meet the rest of the group. Once with the rest of the group [too many names to remember to list here! 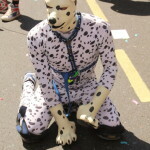 ], I finished off putting the hood, paws and knee pads on, and became my pup self. … Then the rain started!!! 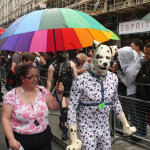 Luckily we bought a rainbow brolly and it was big enough to keep this pup and Caz dry. 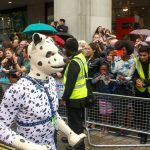 Whilst waiting for the Parade to start I bumped into a few people I knew which was fun 🙂 *wags* and we all hoped the rain would pass – which by luck, it did just before we started. 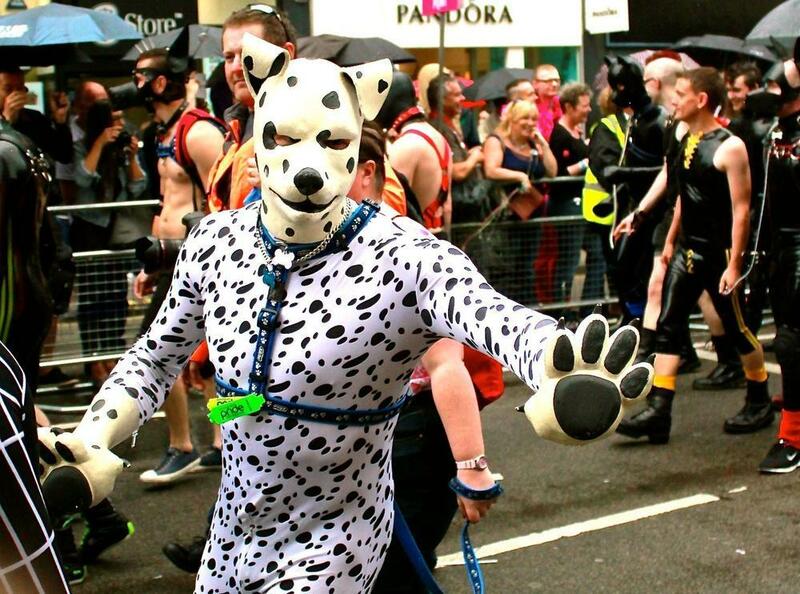 The main parade for me is a bit sketchy, as when in full pup mode, I don’t seem to really recall much, mainly because I’m enjoying just being a pup. The rain stayed off for the most of the event, but when we did have a light drizzle my surrogate handler (Caz) did an excellent job of keeping me dry with the brolly. The end seemed to come all to quick, and the group got directed into a side street to be able to have a mass group shot (or 2 or 3 or 4 ……. ) and then de-pup and head off our separate ways. 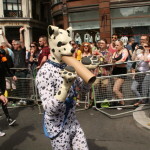 The decision for us was to head off back to Baker Street to the Nandos Chicken restaurant there to have some dinner …. 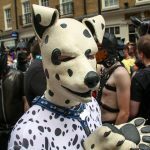 though after dinner, I re-pupped up (as I hadn’t taken off the Zentai or knee-pads yet) and travel back home as a puppy on the train which caused much amusement to the carriage we were in – and it also confused the Beagle Bio-Dog that got on with us! 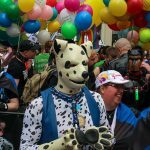 *Wags* Thank you 🙂 – If there are any other pictures out there I’d still love to see them.